Busting out the brussels sprouts today! And the b-b-b-b-bacon. As if there were another way. Also, family. And friends. And everything else. Being one of the 20-somethings in the family (not for much longer though! eek/wahh! ), I take my ongoing role as Salad Bringer very seriously. Sort of. In my life, and most especially during busy times like T-giving, I am almost always running late or behind or forgetting something really super important. Scrambling around at the last minute, throwing this green and that crunchy together and tossing it with a few drizzles of everything, trying to figure out how to balance it on my lap while also holding my to-go coffee and trying to do my makeup from the passenger seat on the little trek back to our hometown for the big feasts. Oh yes I just said feasts. Plural. Being from the same hometown means Bjork and I eat TWICE on Thanksgiving Day. For which I give big thanks. But being the last-minuter that I am, and also being the Salad Bringer who also happens to be the FOOD BLOGGER, Thanksgiving usually means it’s time to bust out the old standby – everyone’s favorite Bacon and Brussels Sprout Salad recipe. It’s simple, maybe even simple enough for me to spare a few minutes to do my makeup BEFORE getting in the car? meh, I don’t know, let’s not push it – and seriously, against all brussels sprouts odds, every single person in my family ranging in age from 12 to 78 years old totally loves this salad. It’s wonderfully bizarre. To the point where I feel nervous to talk about it too much even right now for fear that the magic salad spell will break and suddenly someone will realize THEY’VE BEEN EATING BRUSSELS SPROUTS FOR THE PAST THREE YEARS. The inspiration for this salad came a few years ago when I saw this recipe in a magazine and I decided to try it on a whim. And you guys. This was back before brussels sprouts were a thing. I don’t think I had ever once eaten on of those little baby green cabbies before this salad but maybe back in my youthfulness I was on the cutting edge of trends. *pushes glasses up on nose* The recipe was from a restaurant chef but I was drawn, per the usual, to the simple ingredient list. And not only that, but there was nothing fancy about the prep because this salad = raw, completely raw brussels sprouts. Raw as in R-A-W. No stinky cooking, no superstrong aftertaste, nunna that. All it took was one time with this recipe and I was completely ruined on enjoying brussels sprouts any other way. I generally can’t do cooked brussels sprouts – except roasted, maybe. 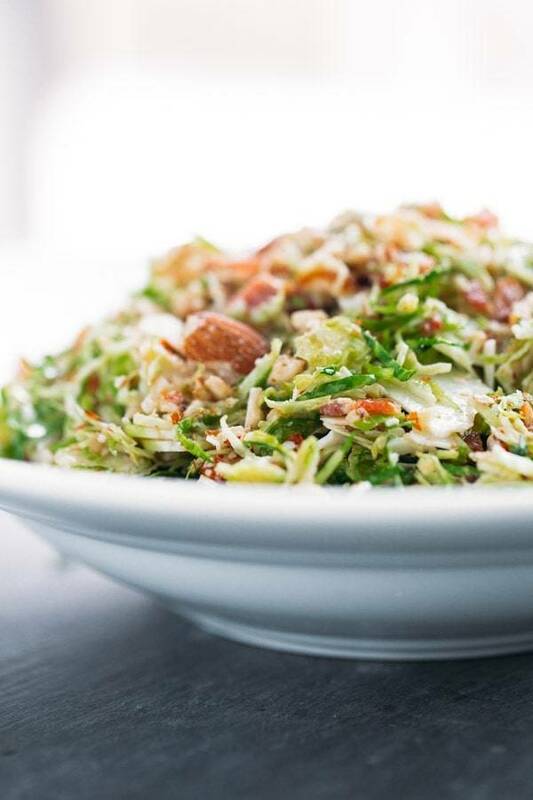 caramelized, okay yasss – but I can always always always find big love in my heart for a bite of fresh, raw, paper-thin shredded brussels sprouts tossed with a light citrus vinaigrette and the flavor-texture trifecta of bacon, almonds, and Parmesan. My favorite part about this salad HANDS DOWN is the texture of the brussels sprouts. I wash them, take a moment to admire their rustic texture and general adorableness, and then shave them into thin little ribbons of heavenly lightness with a nifty little handheld mandoline . It seems like the kind of thing that would take a long time, but you guys. Don’t you even know me? As a general rule, I will not mess around with food prep things that take forever and a day. I can get through a whole pile of those sprouts in about seven minutes. NBD. One food snobbery comment for the record (just imagine me saying this with condescending spectacles and a china cup of tea with my pinkie in the air) – you can use a bag of pre-chopped brussels sprouts to make this salad, but that doesn’t mean you should. I see those pre-chopped brussels singing out to us Time Savers and Salad Bringers from the shelves at Trader Joe’s and even now at Target, and I will admit – those marketers know how to tempt me. But honestly – and I don’t just say this just to be an obnoxious food blogger – the texture of those pre-chopped brussels sprouts is chopped, not shaved, which makes them clunky and big and just not very awesome in comparison to the papery, light, perfectly delicate crunchiness of brussels sprouts that are mandolin-ed by you yourself. End of food snobbery soap box rant. Today is a super exciting day for 1-2-3-4 reasons. One: Countertop install happens today at 10am! oh my gosh oh my gosh! I will post a picture on Facebook later today because I can’t not. Two: This week I joined a co-working space where all the self-employed millennial kids go to play, I mean, uhmm, work, and today will be my first day “in the office” which means I get to sit amongst old brick, exposed beams, hipsters, and big windows with views of downtown while dreaming of which food truck I will go to for lunch. Look mom! I’m all grown up! Three: It’s still snowing. I still like it. Four: Leftover bacon and brussels sprouts salad in the fridge. Crunchy almonds, sharp Parmesan, savory bacon, and those paper-thin brussels with the lightest of light orange-lemon vinaigrette. Awyeah. AND JUST SO YA KNOW! Here’s the mandoline (affiliate link) that I’ve used for this recipe for the last three years – works like a charm every time. I also use this for thinly sliced potatoes (I’ve got a recipe for those coming up that I am oh so excited about – eeeeeeh!) and thinly sliced apples for this cake, but honestly, this bacon and brussels sprout salad (and brussels sprouts salads in general) is the thing I use my mandoline for the most often. And even if that was all I ever used it for, it would be well worth the $14! It’s an early Merry Christmas to your brussels sprouts loving self. This Bacon and Brussels Sprout Salad is a perfect side dish for holidays, with shaved brussels sprouts, chopped bacon, and a light citrus dressing. Combine the lemon juice, orange juice, apple cider, and shallots in a small bowl. Add the olive oil in a steady stream and whisk for a minute or two, until it becomes creamy-looking. Slice the brussels sprouts with a mandoline, taking care of your fingers! and slicing them as thin as possible. This works best when you hold the stem, slice from the top, and stop with a little bit left at the bottom, discarding the remaining bottom stem part since it’s not very leafy anyway. The thinner the shreds, the better the salad! Toss the shreds and loosen them with your fingers to they separate and fluff a little bit. Toss the brussels sprouts, almonds, bacon, cheese, and dressing together. Serve immediately or within a few hours of tossing. Disclosure: this post contains affiliate links! And did I mention how much I love that handheld mandolin slicer? PS. I’ve already shared this recipe once on the blog, but I felt like it deserved another post. If you want a sampling of how the blog has changed from then to now, here’s the original bacon and brussels sprout salad post. Enjoy. Or giggle. Whatever. You’re totally right, those chopped Brussels sprouts are no kind of good. Your papery-thin shavings look epic, though. I knew I bought that mandolin for a reason! We love brussel sprouts in our house. In fact my kids like them better than some of the other more main stream veggies, but we never eat them raw. This looks terrific! So jealous of your “workplace.” Also I’m so happy to see a raw brussels recipe! My boyfriend and I recently ate a raw brussels salad in Chicago and about died we loved it so much. Saving this recipe for the big feast in a few weeks! Right? It’s the only way! I am not a Brussels sprouts lover, but I want to be. I have a feeling this recipe will be my first step towards being a real grown-up. I’m also super jealous of your new work space! How fun! I feel like you’re living the American dream. I would love to see pictures of the work space, so I can live vicariously through you! Thanks Michelle! Sometimes I feel like I’m living someone else’s life. It’s so weird that this is what we’re doing during this season of our lives. 🙂 Thankful! Starting with raw brussel sprouts might not be the best idea, although this recipe looks super! Have you tried doing this? Shave parmesan cheese over them right before serving. Make sure you really cook them through, as the more cooked they are (to me, anyhow), the less bitter they are. 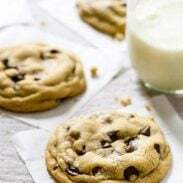 They seem to be an acquired taste, but I am sure you will end up liking them!! Do it! It’s brussels sprouts best friend! COLD! That’s cold. Even I would be cold in that weather. It’s sad how excited this recipe is to me! It may be the way I get hubby to beat brussels sprouts! Thank you Lindsey! Love all the flavors in this! And I’m not a big brussels sprouts person but will give this a try! Brussel sprouts and bacon is such a classic Thanksgiving combo in these parts, but I’ll admit that I’ve never tried raw brussel sprouts! Would love to try this twist but I’m pretty sure my fam (and mostly my boy) would be disappointed if I didn’t serve up cooked brussel sprouts with bacon. Maybe I’ll try this not for the holidays then, but just a weeknight or whatevs instead. Sounds great! I hope you like it Jill! I would eat ALL the RAW mandolin-ed brussels sprouts if they came with “bacon, Crunchy almonds, sharp Parmesan, savory bacon, and … the lightest of light orange-lemon vinaigrette” Thanks so much for sharing this and cannot wait to see y’alls countertops! I love brining the green stuff too, and with the bbbbbbacon involved, I know my meat ‘n’ taters family will be on board too! This is literally the only way I want to eat a salad in winter! And I also totally agree with you about the difference between chopped and shaved! #teamshaved! I might be missing something, but I don’t see the link to the mandolin – how can I see it? Thanks!!! Hi Amy – just checked and it should be there! Otherwise just google OXO handheld mandoline. What a prefect way to spice up the Brussel Sprouts! I like to use the thin slicing disc on my old Cuisinart to slice the Brussels sprouts. They come out really nice AND faster than the mandoline. Just sayin! Great idea! I just got a Cuisinart with a slicer but I haven’t used it yet! Can I get a tutorial on how you can slice your brussel sprouts in 7 minutes??? I have a very similar slicer although a different brand which I have used for some of your other brussel sprout salads (quite delicious by the way) but I always find that it takes more like half an hour with the slicer. What am I doing wrong???!!! That’s a great idea, I was just thinking about that. Maybe we can do a quick video and add it to this post. I’ll work on it! Just curious…how many cups do you think 48 brussel sprouts make? Cups after shredding or cups before shredding? I would say you should end up with 5-6 cups of shreds. I just want to double-check that you add apple cider to the dressing and not apple cider VINEGAR???? Thanks. Can’t wait to try this! I LOVE Brussels sprouts….never tried one until a year ago! Hi Karen! It was apple cider! Bacon & brussels sprouts. Amazing. Annddddd know I want a mandoline.